It was a ritual in our home that everyone recited the Twenty-third Psalm at the end of the evening prayer and the same was recited at our church at the end of the Holy Mass. This Psalm is applicable to one and all, irrespective of one’s religion and it reaffirms one’s faith in their God. 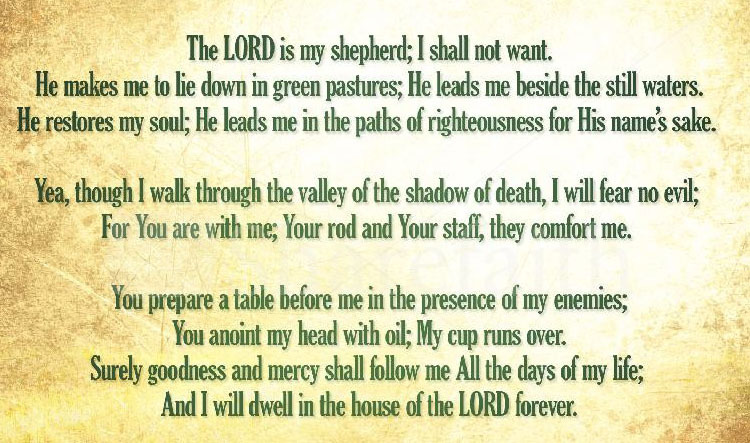 The Twenty-third Psalm begins with “The Lord is my shepherd; I shall not want”. In the Malayalam version which we recited as children, the “I shall not want” part was translated as “എനിക്കു മുട്ടുണ്ടാകുകയില്ല” (enikku muttundakukayilla), and I always looked at my knees after reciting it, as it literarily translated in any child’s mind as “I will not have my knees”. God will open the door only if one knocks and hence the aspect of “I shall not want” in Psalm 23 is debatable. Without the ‘wants’ humanity would have never progressed and developed to its current stature. The modern version of the Psalm has put it more aptly as “The Lord is my shepherd; I lack nothing”. These ‘wants’ always tempted me to dream, about anything and everything I came across as a child, mostly to be rebuked by elders saying that I was wasting my time dreaming – even the act of dreaming was rationed in our childhood—‘Who can dream what and how much’ was somewhat a pre-decided issue! As I grew up and came under the stewardship of Late Mr PT Cherian, our House Master at Sainik School, Amaravathinagar, Tamil Nadu, who always encouraged us to dream –to dream big – that too King Size. As I grew older I read the Wings of Fire by Dr APJ Abdul Kalam wherein he says that “Dream is not that which you see while sleeping it is something that does not let you sleep.” This was the predicament I always faced while dreaming that it delayed my falling asleep and the same continues to date. Veteran Commander D Reginald was my companion to operate the public address system in the school under the guidance of Mr PT Cherian while studying in Grade 9 (1974). All the amplifiers, speakers, cables, etc were kept in Mr Cherian’s Physics Lab and on Sundays after lunch we both would go there to carry out regular maintenance. Once we were accompanied by our friend S Harikrishnan (currently Manager, State Bank of India), who was an accomplished singer. The idea was to fulfill Hari’s dream of listening to his voice duly recorded on the audio cassette recorder. Being Sunday afternoon, we knew that Mr Cherian will never be around as he always enjoyed his afternoon siesta and never ever wanted to be disturbed at that time and there would be no one to stop us from (mis)using the precious cassette recorder. We recorded Hari’s song and played back the recording. That was the first time he ever heard his own singing. Hari had the brightest and the biggest eyes amongst us and he was so excited that his eyes bulged out like search lights. We have encouraged our children to dream and the effect of it is mostly heard from the washroom. I always hear their monologues, dialogues, role-playing, singing, etc while they spend their time in the washroom – the most private time one ever gets. I was really scared of doing this while growing up on the fear of what others will think about me (mad?) and so I could never give expression to my dreams. One must dream, that too dream unlimited. That is when one gets into a creative mood and comes out with ‘out of the box’ ideas. Imagine if Newton or Shakespeare or Ved Vyasa did not dream; the world would have been surely poorer. Some of our dreams may fructify in our life time like the video recording dream we had as children; some we would be able to implement ourselves as we grow up. One such dream I always carried was that of the ‘Bara Khana’ (Party for the soldiers) in the regiment. One always saw the chefs overworked in the kitchen, many soldiers toiling it out for erecting the tents, making seating arrangements, organizing entertainment, serving food and drinks, etc. Many soldiers took it as a ‘punishment’ and not as a time to make merry. My dream was that all soldiers in the regiment should be free from all chores and commitments and be free to enjoy the party with their families and friends. On return to our permanent location in Devlali after an year long operational deployment, Late Col Suresh Babu approached me with the idea of party for the entire unit with the families. That was when I gave my directions based on my dreams – everything should be contracted out – from tent pitching, decorations, entertainment, food preparation and service – each and everything and no soldier would toil for it. The only hitch which Col Babu projected was that the waiters of the contractors will not be familiar with the military protocols and hence may not serve the Commanding Officer first and so on. I was fine with it as I never had any ‘doubt’ that I was commanding the unit. On the day of the party, there were round tables laid out with chairs for all officers, soldiers and their families to sit and the contracted entertainment troupe started off with their performances. Snacks and drinks were being served by the contractor’s waiters and each and everyone enjoyed the proceedings. At this time our chef came to me and said that it was the first party he attended. that too wearing his best clothes and thanked me immensely for arranging this. All the soldiers were unanimous that it was the first time they wholeheartedly enjoyed an evening, otherwise they would be running around and also closing down everything after the party. After the success of the first outsourced party, we decided that we would hold only two parties a year and would always be outsourced. As one grows up, it would be feasible to implement one’s dreams, but many find it convenient to forget them then. Thanks for reminding me of our dreams of our younger days. Coincidentally we are all meeting today. Reji, your blogs are classic. I should confess that I do not read all of them due to paucity of time, but I look forward to perusing them after my retirement. Do keep writing. Thanks for some lovely pieces Regi. I read them regularly and enjoy them thoroughly. Being in the IAF helps identifying with the subtleties and unsaid feelings and emotions. Compile them and provide this valuable insight to our new entrants. At least you were resolute enough to implement your dream, Reji. Well written as always.